Yesterday I went to see David Icke live in London. He was appearing at his usual place, the Carling Academy in Brixton. I’ve attended every one of David’s live shows since 2002 and this is probably the best one. I thank David as well as Sean, Linda, Ayem and everyone else who made the show possible. The ticket price for the show was £30. That sounds very expensive at first, but actually, when you consider that it is an all-day event at one of London’s top nightspots, it’s an absolute bargain. Amy Winehouse appeared on that same stage only last year and it would have set you back £58 to see her. What’s more her show lasted less than two hours, as opposed to David’s seven and a half! I left home at 6 AM and got to London at 8. I did a bit of sightseeing, walking round by the “Reptile House”- Buckingham Palace and the seat of the Illuminati-Occupied Global Government (UK branch) at Whitehall, Downing Street and The Houses of Parliament. I saw the Ministry of Defence and was in two minds whether to knock on the door and see if Nick Pope was in! I then walked along the river to the City of London to see the Temple Church, the famous esoteric building featured in The Da Vinci Code. Contrary to popular belief it’s quite accessible and easy to find and you can get to it just off the City end of Fleet Street, down an alleyway to the right. Unfortunately it was shut and even the courtyard around it was locked up. I’ll have to go back another time. I arrived at the venue early and was near the front of the queue. I did an interview with a reporter from Kerrang Radio, a station that has featured David a lot recently. But I got the distinct feeling that the interview was a bit tongue-in-cheek. The reporter asked me: “Do you believe in the Lizards then?” I answered honestly: “I think it’s worth looking into. So many people have seen other people shape-shifting that there’s a case to answer. The phenomenon also can be found throughout history and mythology all over the world. I agree that it sounds bizarre, but maybe its bizarreness is the very thing that keeps it secret. There’s no need to suppress something if people are just going to laugh it out of town.” The reporter smirked as if a comedy gag had just come off. 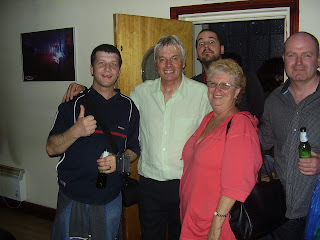 It didn’t take long to meet up with some of the other David Icke Forum members. I already know Thirdwave and Dondaz, but yesterday I also met I Am, PT23, Lostinastrangeworld, Mitch and several others. They all seemed to recognize me, coming up to me and saying “Hi, are you Hagbard Celine?” I must have one of these instantly-discernable faces; is that good or bad!? The best part of the day was that I managed to get a backstage pass, so I could go up to the performers’ lounge and meet David in person. It was lovely to get to talk to David face-to-face at last! I had a couple of beers, although David stuck to soft drinks, and discussed many subjects, along with several other new people I’d met there. I asked David about Professor Richard Dawkins and David echoed very much what I’d written about him myself in my review of The God Delusion (see below): “Richard Dawkins is the ultimate left-brain prisoner.” And that’s exactly it. Unlike Jill Bolte Taylor (see my article A Stroke of Genius below) Dawkins has never had the opportunity to witness the awe and majesty of the right brain when it shakes itself free of the warped and poisoned malfunctioning left-brain taskmaster that lives... has been cultivated... in all our heads. I bought David’s DVD of his appearance at the Oxford Union. I wanted to go along to that personally and even found somebody to sign me in, but unfortunately David had to cancel at the last minute and was rebooked at too short notice. I’m looking forward to watching it because it must have been a challenge for David. The Union has been the central hotbed of controversy in Oxford for almost two hundred years and its members are trained and practiced in grilling people. Still I’m sure David gave them a run for their money! David has been an enormous inspiration to me and his work has totally transformed my life; if it wasn’t for him then HPANWO probably would not exist. It was an honour to meet him. David, as usual, opened his show by playing music. In this case he chose the song A Kind of Magic by Queen. It was very appropriate and set the scene for the lecture very well. David has changed a lot since the last show two years ago. He has lost some weight and looks much healthier. On his birthday last month he announced that he’s gone teetotal. He seemed to have more energy too. At all his other shows performing on stage really seems to take it out of him. He used to pant for breath, sweat and go red in the face; not this time. He had a spring in his step that I’ve never seen before. He’s changed the format of his lectures since the last Brixton show, as you will see if you watch his pay-per-view Mount Shasta talk. He now opens with the holographic universe theory and the nature of reality, goes into the “5-sense stuff”, 9/11 and Reptilians in part two and ends with how to break the spell. His work is concentrating more on the physics and metaphysics of the universe than the nuts-and-bolts of the conspiracy than it used to. However he doesn’t neglect the Bilderberg Group, the Masons and Round Table etc and still explores it. His website still relates information on the political and social consequences of the New World Order agenda. This event was very good-natured and all the rumours I’d heard about organized plans to disrupt it happily proved false. The hecklers who’d spoiled parts of the 2006 talk were nowhere to be seen. In fact the whole sold-out auditorium was united in a celebration of David’s liberating and joyful ideas. 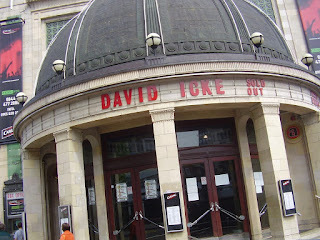 I’m very glad I went to Brixton and I’ll do everything I can to attend David’s future talks. I strongly recommend them to all HPANWO-readers. After meeting David in the theatre I went with all my forum buddies on the Underground to Victoria and spent a lovely hour or so in a pub. I then had only a short walk to the coach station. I fell asleep on the coach home, but was relieved not to suffer the illness that suddenly hit me after the last lecture in 2006. I got home at 1 AM this morning, totally exhausted, but extremely happy. Cool post, Hagbard Celine! take me aboard your submarine! Glad it went well & you got to meet David in person as you'd hoped. Thanks, WW. He was very different off stage to what he was on stage. He was quite calm and softly-spoken. I've heard that he's a rather shy and private man who likes solitude. A nice little review Hagbard, thank-you. It adds a interesting flavour to taste I was left with. Thanks, Alex. Glad you enjoyed David's show. I'm looking forward to his next one! Is it just me or is David looking more like a reptillian? Everytime I see him in a picture, I can recognize some reptile trate. like his eyes or teeth. Interesting article. I went to the 2006 Brixton presentaion and enjoyed it apart from him making us late for the train home. I no longer believe Icke as I am a skeptic and it feels really good, embracing science and all that. I have to disagree with the Richard Dawkins being a left-brained prisoner. His books are so mind blowing and insightful.